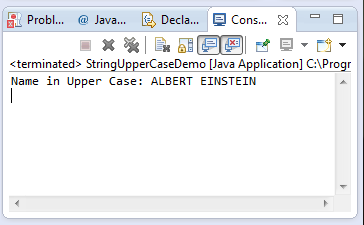 This java tutorial shows how to use the toUpperCase() method of String class of java.lang package. This method returns a new String object which is the original string in upper case. The toUpperCase() method of String class simply used in conversion of String into upper case. This String toUppercase() method returns a new String object which is just the String equivalent in upper case. Since a String can never be changed once instantiated, thus a new string object variable is required to hold the new string during the conversion to uppercase. This method is helpful especially if we are comparing and storing data which comes from different systems. This example source code demonstrates the use of toUpperCase() method of String class.